We had a great day at watching tamanduas. We took a day to travel over to Brazil to meet another amazing animal that calls the rainforest home! 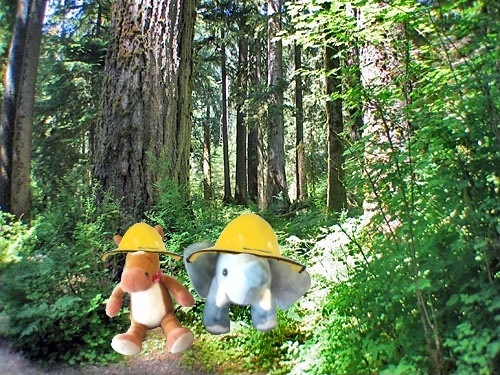 We donned our rain gear and headed in to the forest. These small and agile tree dwelling monkeys aren’t easy to spot, so we had to be patient. We sat for several hours. We could hardly contain our excitement when we spotted a family of the Golden Lion Tamarins we’d been looking for! 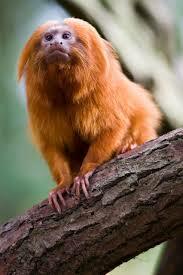 Golden Lion Tamarins have beautiful golden coats and fluffy manes around their faces. They are diurnal (active during the day) and arboreal (live in the trees). 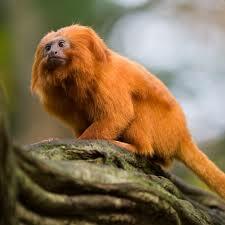 Golden Lion Tamarins live in small family groups led by a female-male breeding pair. 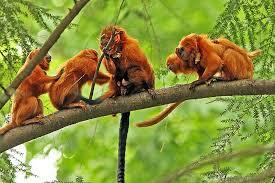 Mother Golden lion tamarins give birth to 1 or 2 offspring. Father Golden lion tamarins take care of the babies and carry them on their backs. They give them to their mom when it’s time for feeding. They have many different warning calls for predators. One call warns of predators on the ground and another warns of predators in the air. These tamarins are critically endangered, but zoos across the country are working very hard to save them. Read about the program here. We were so lucky to see these amazing monkeys in wild! Another amazing animal! I’ve seen Cotton-Top Tamarins, but not these lovely ones!